Many alarms are not in working condition because people tend to forget to replace dead batteries. Replace batteries annually on a specific date like in the fall when you change the clocks back to daylight savings time. Ionizing smoke alarm. Photo-electric smoke alarm. 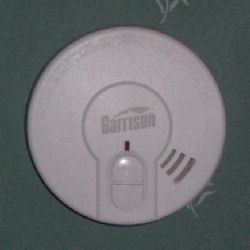 Alarms should be installed on or near the ceiling. Smoke alarms do save lives and are now required on all floor levels. Location. In hallways near bedrooms and as close as possible near stairways. Stairways can act as a natural chimney and even small amounts of smoke can be quickly dispersed throughout the house. Hardwired alarms are alarms that are directly wired into the home's electrical system. A drawback is that they do not operate if there is a power failure. Battery operated alarms. Many alarms are not in working condition because people tend to forget to replace dead batteries. Ionizing type smoke alarms detect combustion by-products and are not practical for kitchen use (cooking fumes). Photo-electric smoke alarms detect smoke and may not be practical near bathrooms (steam). All smoke alarms should be tested monthly.